What a day. What a weekend. I’m putting the labor into Labor Day for sure. Trying to set up a garage sale. I worked 7 hours yesterday sorting through boxes of junk treasures. And then pricing everything. Dad will, of course, tell us we priced it all too low. Then today I worked an additional 4 hours sorting my own priceless possessions. I cleaned out every kitchen cupboard, two linen closets, one catch-all guest room closet, the closet under the stairs and other cabinets. Who buys all this stuff???? We are having a ginormous sale. Of course, I won’t make much money since I am pricing it all to sell. I also know that I haven’t even begun to scratch the surface of stuff I should get rid of. I’m exhausted. I’m hot. I’m sweaty. But it has been a good couple of days. I’ve accomplished a ton of stuff. One more day of cleaning before I go back to work. But I feel good about it all. 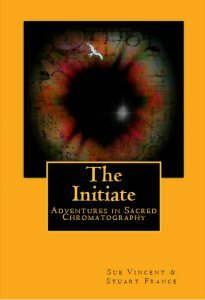 The Initiate is the first book in the Triad of Albion series, an adventure in the landscape of the sacred heart of England… Albion… a place where giants dance in stone, where trees whisper secrets and ancient sites are layered deep in the earth. A trip to the ancient White Horse at Uffington, carved into the chalk in millennia past; a track, five thousand years old, that through the mists to a magic of Wayland’s Smithy and the gnarled stones of the circle at Rollright… overhead the hawks wheel… it is just supposed to be a day out in the landscape for Don and Wen. Work was insane today. Had a couple of back to back special meetings. They went really well, but left me drained. Then off to see my dad. I think he truly is happy. He has laughed more lately than he has for years. He’s eating great and generally has a great attitude. This all makes me happy. I’m grateful that now he and I can just enjoy each other’s company. I still have to take care if his affairs, but it’s mostly routine stuff. He and I giggled tonight when he was telling me a story of someone he saw in therapy today. And again when something happened with his roommate. I do love my dad and this time together is precious. And did you see my feature on The Story Reading Ape’s blog? Tell me what you think. I really haven’t been in the blogging habit of late. I have been reading your blogs (at least a few of them), I have taken time to “like” some of the posts, I have even reblogged a few. But my WP app on my iPhone is screwy and prevents me from commenting as much as I would like. But I’ve been here and I will try and be better. So, what’s new with me? Not really a lot. Visiting my dad in the nursing home every day, but at least I’m able to get home every evening and even go out with friends from time to time. I have been complaining that my van doesn’t drive right (not always though). It has felt like it wasn’t always getting gas. Of course, I’m just a dumb woman. Warren noticed a time or two but he would fiddle with something or other under the hood and it seemed to be okay. I think that was just dumb luck because the next day it would happen again. Well, tonight we went to the dreaded mall (I hate shopping). It is about 40-45 miles away from home. I drove. We came out and got in the van and I started it – well, I tried to start it. It wouldn’t start for anything. The good news is that Warren was with me. The bad news is that it didn’t matter and I couldn’t call him to come and get me. I did call a friend who lives nearby and she came and picked us up and drove us home. The other good thing is that my dad has his ramp van at the nursing home. Since he can’t drive, he obviously doesn’t need it. So, we went down there again tonight and I picked it up so I could get to work. We suspected it was the fuel pump. I looked online and pulled up symptoms of a fuel pump going out. Guess what – every single symptom are the things I’ve been complaining about. Next step, find a fuel pump. Well, really the next step is for him to rent a car dolly and drive up to get my van tomorrow and tow it home. But THEN we need a fuel pump. Called Auto Zone and they want $321.99 for the parts. OUCH!!!!! Again, back online – I can order the exact same thing for between $60-$80. Of course it means waiting for the part. But for that much of a difference I will just drive my dad’s van. Warren can replace the part thankfully. So, it has been an eventful night – I think it is a sign that I should go to bed and pull the covers over my head. But first, I have two chapters to finish in Charles Yallowitz’ The Compass Key and a review to write. It seems I have only been reading late at night and I keep falling asleep. Tonight I will finish it no matter what though. Watch for a review later. At first glance you might be forgiven for thinking this a ‘woman’s book’. Its characters revolve around women and some of the issues raised are certainly primarily feminine; though even there the writer challenges preconceptions for these issues should be primarily human. It is not the literary equivalent of a chic flick… it is a book that makes you think. It is not always a comfortable read, but it is well written, well told and engrossing. I saw a post by S.K. Nicolls on her website. Susan tells a good story, even within the limited scope of a blog post, and the details of her personal journey of discovery intrigued me. I bought the book.